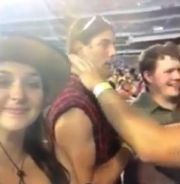 Riley Cooper got racist at a concert. The video surfaced around today about a month since the incident and the backlash has been intense. Cooper in his anger to what was reportedly a security guard is unacceptable and saying “I will fight every n***** here” is just not right. Since then, he’s apologized on Twitter and spoken to the media. on it. The team has also fined him. While meeting with the media, Cooper stated that he wasn’t raised that way and that he was disappointed. But why was he disappointed? Disappointed by his actions or disappointed that he was caught? Cooper: I wasn't raised this way. Parents extremely disappointed. Team has fined him. Confrontation was with security guard. Here’s my issue with this. He may claim that he wasn’t raised this way but he chose to live it. The fact that he was so comfortable with the word means that he on his free time had to use it often. You don’t do things unless you’re comfortable doing it. You don’t use words you don’t know unless you use it often. And in many cases with people in general, when frustration, hatred and pressure gets to people, their true identities come forward. For some people, the pressure allows people to react heroically. For some people, the pressure forces people to crack. That is a glimpse of the person’s true mettle. For Cooper, his true self showed that he was racist and he was comfortable using that word openly. That was his natural instinct. This reminds me when Kobe Bryant threw a gay slur at an official. Bryant was angry, frustrated and in his reaction to it, he got homophobic. I truly believe that people, by nature when emotionally distraught, drop their mask and front and show their true selves. I believe at that time, Bryant was likely comfortable using that word all the time and it showed and he got caught. His natural instinct when angered was to be homophobic. It also reminds me of the time when Alex Rodriguez did his karate chop. Some of you may remember this. I remember it vividly. While trying to avoid the tag, Rodriguez resorted to cheating by knocking the ball out of Bronson Arroyo’s glove. I’ve had friends try to defend this but I don’t buy it. He knows it’s illegal, but he did it anyway. But when the pressure and frustration was on for Rodriguez and his failure to deliver, he resorted to cheating. It was his natural instinct to cheat. And let’s not forget the “HA” incident with the Blue Jays. Or actually, the steroid use too. That was the first indicator that Rodriguez was a cheater. We all first got a glimpse of it when a frustrated and angered Rodriguez cracked and showed his true self. This isn’t to say that people can’t change. Bryant has since then wiped off the label of being a homophobic. He hasn’t done anything since then to make us think he still is like that. I can only hope that Cooper can find some way to prove to us that he is exactly what he claims to be in his apology. But for that one split second, the mask was dropped and Cooper let his guard down. Instead of the front he had been putting up for so long, his racist self showed up. I want to believe that he is truly sorry for the remark and not for being caught. As Kobe Bryant has shown us, people can change. But then again, Alex Rodriguez has shown that some people will never change. It’s a sad incident and I can’t imagine the kind of questions Cooper will have to field from the media and his teammates. He can’t put his mask on anymore. People have already seen his true identity. This entry was posted in Commentary, NFL, Philadelphia Eagles and tagged Alex Rodriguez, Kobe Bryant, Racism, Riley Cooper. Bookmark the permalink. Reblogged this on Pro Sports Rants.